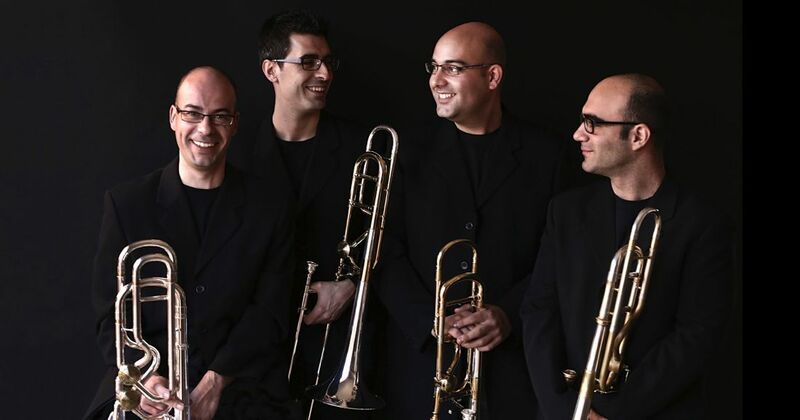 2i2quartet was formed in April 2000 in the heart of the “Spanish Brass” Academy. Its members are Jordi Navarro Martín, Juan Carlos Matamoros Cuenca, Francisco Juan Rodríguez “Kiko” and Miguel José Martínez “Viriato”. In 2001, they were awarded in the Permanent Competition of Young Musicians of Spain, which took place in Granada, Spain. They have performed in concerts in the National Auditorium of Manuel de Falla in Granada, the Week of Contemporary Music in Girona, the International Festival of Segovia, the Festival of European Music, the Madrid Circle of Fine Arts, the Conde Duque Cultural Centre in Madrid, Valencia Palace of Music, the Spanish Brass Festival, FESMON, at the Academy of Art in Tirana (Albania), the Migjeni de Shkodër of Albania, National Auditorium of Madrid, the Altea Palace, the Castelló de la Plana Palace of Congress, the Solís Theatre of Montevideo, Uruguay, the Coliseo Theatre of Buenos Aires, Argentina, the Franca-Brasileira House in Rio de Janeiro (Brasil)…some of which have recorded and re-emitted by Spanish National Television (RTVE), Radio Televizioni Shqiptar, and other music-oriented channels at a national level. In April 2004, they were invited by the Community of Valencia’s Youth Orchestra as soloists where they debuted at a national level Jan Koetsier’s “Concertino for Trombones and Strings” under the direction of Manuel Galduf. From the beginning, the group focused on teaching and this is reflected in the annual course that they hold since 2001. Students, in addition to receiving classes from the group’s members and prestigious guest professors, also attend a wide variety of concerts. This pedagogical spirit led them to combine their efforts with the trombonist Francisco Soler to create “Jornadas Trombonísticas” in July 2006. This fusion has allowed them to grow the activities they offer, their teaching staff, the types of concerts offered, the number of students and special guests, as well as to debut works composed and dedicated especially to 2i2quartet. Their obsession for their repertoire is one of the group’s priorities and in this vein they look for lost and forgotten works that have since been re-interpreted by modern composers; this helps them form a bond with music from different time periods and different styles. To this end, the group created their Collection of 2i2quartet Sheet Music for the journal Tot per l’Aire. In 2007 they were selected as one of the groups for the Circuitos de Música Injuve. In February 2007, they decided to release their first disk entitled Memòries which was later accompanied by a second, 2i2 versos, released in 2010 to mark the group’s tenth anniversary. In July 2012, the group was invited to participate in ITF’12, an event organised by the International Trombone Association and held in Paris. 2i2quartet thanks Stomvi for their support and uses their Titán line of instruments.